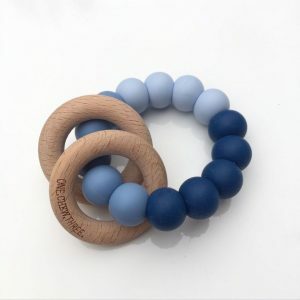 This DUO teether gives your little one the best of both worlds – a soft, chewable silicone ring to soothe and massage sore gums and a hard, natural beech wood ring to provide greater relief and assist teeth to break through that last layer of gum. These are modern, practical teethers at its best! Made from high quality, 100% food grade silicone beads that are free from BPA, lead, cadmium, phthalates, PVC and latex. They will not absorb odour or support the growth of mould, fungus or bacteria. Complemented perfectly with a large 7cm untreated beech wood ring, which are naturally antibacterial and non-splintering and sanded to a silky smooth finish. The wooden rings are left untreated to avoid allergens and sensitivities – you can choose to add your own oil/wax if you wish (we recommend coconut oil) or leave them just the way they are. Safety is super important so this teethers is independently tested to meet Australian Standards (AS/NZS 8024). Packaged in a reusable 100% cotton calico muslin pouch, perfect to keep your teether safe and ready for the next chomp session. Much safer than floating around loose in the nappy bag! Hand-stamped with the ONE.CHEW.THREE logo in permanent ink, these pouches are also machine washable.